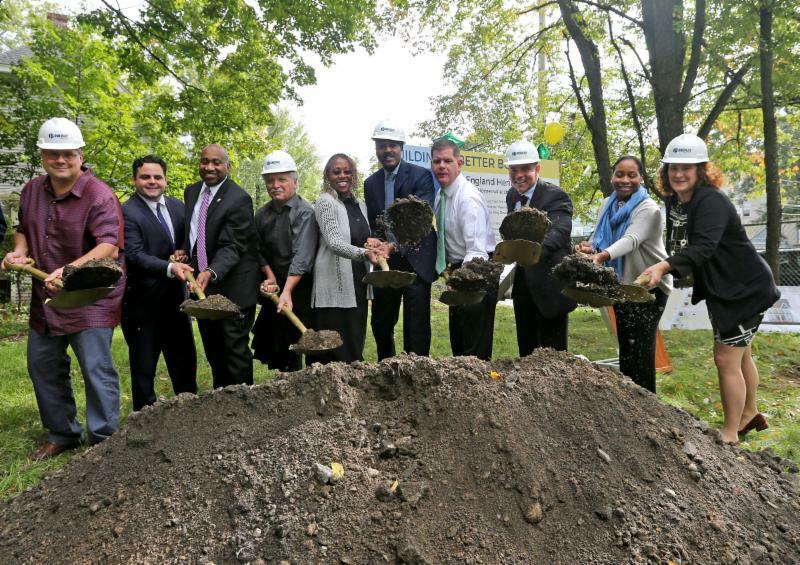 BOSTON - Thursday, October 4, 2018 - Mayor Martin J. Walsh today joined Codman Square Neighborhood Development Corporation, the Talbot Norfolk Triangle (TNT) Neighbors United, elected officials and residents for the groundbreaking of New England Heritage Homes. The $7 million, transit-oriented development, will create 16 mixed-income homes in Codman Square, Dorchester. The project is part of a larger community effort to target development opportunities near existing and planned stops on the MBTA Fairmount commuter rail line. "I'm very proud of how we've harnessed the strength of Boston's economy to create more affordable homes for our residents, and have transformed these former lots into new homes for families," said Mayor Walsh. "As our population and economy grow, projects like these are very important to our housing strategy. I want to thank the Codman Square Neighborhood Development Corporation and neighbors for their dedication to this project and their commitment to our communities." Once completed in the fall of 2019, the new development will offer 16 housing units affordable to middle-class households earning 100% Area Median Income (AMI) or below. The project will have a green design and construction that meets LEED Silver Certifiable standards, and will consist of two single-family homes and 14 single-family duplex homes. The parcels, which include two City-owned vacant lots, are located within Dorchester's Eco-Innovation District (EID), and are within a quarter mile of the MBTA Talbot Ave Station on the Fairmount Line. Total development cost for this project is more than $7 million, and was made possible in part by a $1.2 million investment by the City of Boston, $450,000 from the NeighborWorks America, $100,000 from MassDevelopment, and $4.7 million from the Life Initiative. "We are pleased to work with the City, funders and the Talbot-Norfolk Triangle Neighbors United group to build these 16 homes for sale to first-time, moderate-income homeowners," said Gail Latimore, Executive Director of Codman Square Neighborhood Development Corporation. "We view this as part of our neighborhood stabilization and anti-displacement strategy. We look forward to welcoming these new homeowners into the neighborhood!" New England Heritage Homes consists entirely of affordable units to middle-class families strongly aligns with the City's housing goals outlined in Housing a Changing City: Boston 2030. Mayor Walsh recently increased the City's overall housing targets from 53,000 to 69,000 new units by 2030 to meet Boston's population growth. These updated housing goals, build on Mayor Walsh's commitment to increasing access to home ownership, preventing displacement and promoting fair and equitable housing access. The project also contributes to the newly-announced regional housing production goal of creating 185,000 new units of housing across the region by the year 2030. In a collaborative effort to meet the demands of a robust regional economy and a growing population, the 15 cities and towns of the Metro Mayors Coalition set goals to prevent displacement, preserve neighborhoods, reduce evictions and homelessness, promote mixed-use development, and build a diversity of housing types for all income levels throughout the entire region. The new homes will be part of a connected and walkable community as the City and neighborhood work together to improve traffic safety and mobility in the area, including the reconstruction of New England Avenue. As part the Neighborhood Slow Streetsprogram, the City's residential traffic calming initiative, the Talbot Norfolk Triangle neighborhood was one of two pilot zones where the speed limit was reduced to 20 mph and self-enforcing physical changes to streets were installed including speed humps to slow down vehicles, daylighting to provide greater visibility at corners, and tactical curb extensions to improve pedestrian safety. The first two Neighborhood Slow Streets zones were implemented in 2017 in the Talbot Norfolk Triangle in Codman Square and Stonybrook in Jamaica Plain. Work is well underway in five zones, and five new zones selected this summer are in the planning and design stage of the process. Additionally, four new Bluebikes stations were installed as part of a significant expansion of the bike-share program owned by the City of Boston in partnership with the municipalities of Cambridge, Brookline and Somerville.